The Chilean has agreed a three-year deal with the Premier League outfit. 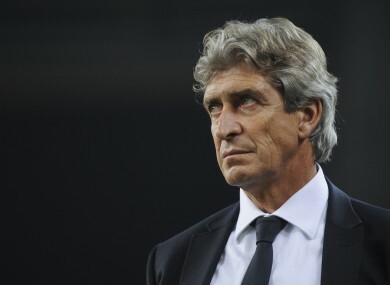 MANCHESTER CITY HAVE confirmed the arrival of Manuel Pellegrini as their new manager. The 59-year-old Chilean, who has managed Real Madrid and Villarreal in the past and led unfancied Malaga to the Champions League last 16 last season, was hotly-tipped to succeed Roberto Mancini and joins on a three-year deal. In a statement released by City, he said: “I am delighted to accept this hugely exciting opportunity. The Club has a clear vision for success both on and off the pitch and I am committed to making a significant contribution. Pellegrini will be tasked with wrestling back the Premier League title from city rivals Manchester United as well as making an impact in Europe with City’s expensively-assembled squad. Spanish international Jesus Navas has already been added in recent days and further arrivals are expected in the coming weeks. Email “Pellegrini takes the reins at Manchester City ”. Feedback on “Pellegrini takes the reins at Manchester City ”.